Leon Bonnet (1868-1936) coastal scene oil on board 12 x 16″, lovely 22k gold frame p.o.r. Painter. Born in Philadelphia, PA on Sept. 12, 1868. Bonnet came from a long line of French artists. His great-uncles Charles and Jean Baptiste Durand were portrait painters and his grandfather, Charles Emite Bonnet, an architect and engineer, was invited from France to assist in designing the U.S. Treasury Bldg. Leon Bonnet first studied with his father who was a professional artist. 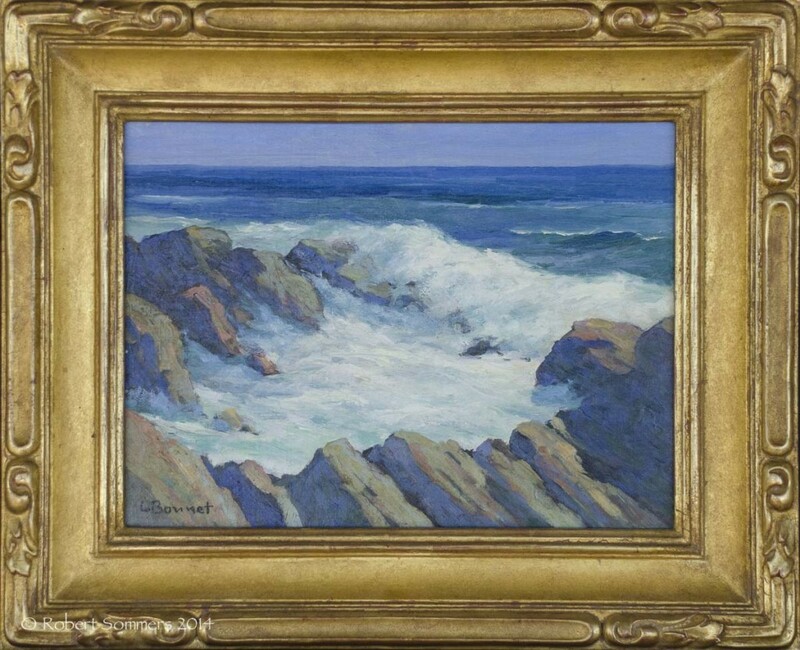 He then studied at the PAFA under Eliot Clark and Edward Potthast.He had studios in Tuxedo Park, NY and Ogunquit, ME before settling in San Diego in the late 1920s. His early works were mostly marines; however, in California he switched to desert and mountain landscapes.Bonnet died in San Diego on June 22, 1936. Collection: San Diego Historical Society. AAA 1921-33; PAP; SCA; WWAA 1936-39 (obit).